The "Böhmische Hofkanzlei" or Bohemian Court Chancellery is a Baroque building in the historic city centre of Vienna, namely between the Judenplatz Square and the old city hall. The Böhmische Hofkanzlei was an organisation that existed between 1527 and 1749. 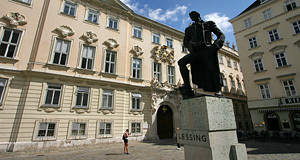 Today, the Baroque palace is home to the Austrian constitutional court (Verfassungsgerichtshof) and administrative court (Verwaltungsgerichtshof). The Bohemian Court Chancellery as an organisation was formed in 1527 under the rule and by order of Emperor Ferdinand I. The same year, Ferdinand had become King of Bohemia - a very big move upwards on the career ladder for the Habsburg family, because Bohemia was one of the oldest and most distinguished principalities in the Holy Roman Empire of German Nation. More so, the monarch of Bohemia had the privilege of participating in the election of the Emperor - a right that the duke of Austria (the Habsburgs) did not have. With the crown of Bohemia, the Habsburgs therefore gained a joker in the elections of the Emperor. The original Bohemian Chancellery was - surprise - in Bohemia, more precisely in the Hradschin Palace of Prague. It was here that the Bohemians threw Imperial delegates out of a window in 1608, thereby provoking the outbreak of the 30-Years′-War. In the course of this bloody conflict, the Böhmische Hofkanzlei was transferred to Vienna in 1620 and was directly under the rule of the King of Bohemia (the present Habsburg ruler and thus the Emperor). Its role was mostly of administrative nature. The current Baroque palace at Judenplatz Square was designed by Johann Bernhard Fischer von Erlach (who died nearby) and built between 1709 and 1714. Even for a Baroque Palais, the gates are particularly splendid and depict the Bohemian lions. Under the rule of Empress Maria Theresia, the administration of the crown lands was centralised and the chancelleries were dissolved (the Bohemian was only one of several). From 1749 onwards, new institutions took over the part of the Böhmische Hofkanzlei and the palace was used by different state organisations. For these, the building was soon too small and the original Böhmische Hofkanzlei was extended between 1751 and 1754. This explains the courtyards and arcades that connect the central Palais with side-buildings. Over-all, the building has still relatively much uniformity it its outline. The extension was planned very considerately by the architect Matthias Gerl - the building doubled in size, got a new façade on the backside (the one facing Judenplatz) and a new staircase without destroying the original ensemble by Fischer von Erlach. There were other, less considerate refurbishments in the 19th century, when especially the interiors of the Böhmische Hofkanzlei were re-modelled. Didn′t matter, though: In the course of WWII, the building was hit by a bomb and heavily damaged in 1945. When it was re-built (or repaired, depending how critical you are), the Böhmische Hofkanzlei was adapted to the 20th century: The Judenplatz entrance became the main one, the previous front side gained a passage way for pedestrians. Today, the Böhmische Hofkanzlei makes a nice Baroque ensemble in combination with the old City Hall of Vienna on the other side of the street. Attractions nearby include the Museum am Judenplatz; the Am Hof Square with the Kirche am Hof; the Freyung with the Schottenstift and Palais Ferstel; the BA-CA-Kunstforum; the Gothic church Maria am Gestade; the Ruprechtskirche; and the Hoher Markt with the Anker Clock.